While the paper is devoted to the railroad bridge, the writer very properly first briefly sketches the past history of bridges in America, as well as the imperfect data will permit. The "Great Bridge," built in 1660 to connect Cambridge and Brighton, near Boston, was a pile bridge and the first of record. For about 100 years we hear of no other, until, in 1761, SAMUEL SEWELL built a bridge over York river in Maine, 270 ft. long, supported on 13 piers. In 1786 this same SEWELL built a bridge 1,503 ft. long on 75 piers over the Charles river at Boston. Records show that a year or so later there were similar bridges at Malden and Beverly, Mass. In 1792 Col. WM. P. RIDDLE erected the Amoskeag bridge at Manchester, N. H. This structure was 556 ft. long, and was supported on five piers and two abutments. It was commenced on August 3, "at which time the timber was growing and the rocks dispersed in the river," and was finished on September 29. Between 1785-92 Col. HALE crossed the Connecticut river at Bellows Falls with a bridge 368 ft, long in two spans. The West Boston bridge, 3,383 ft. long on 180 pile bents, was finished in 1793. About 1800 a pile bridge, in 25 ft. bents and nearly one mile, long, was built over Cayuga Lake, N. Y. In 1795 the Mohawk river was crossed by a bridge 960 ft. long on 13 piers. In 1792 TIMOTHY PALMER built the Essex-Merrimac bridge over the Merrimac 3 miles above Newburyport, Mass. There were two bridges starting from Deer Island in the river. An arch of 160 ft. span and 40 ft. above high water made up one bridge; but of the other it is only known that it was "wider," with a center arch of 140 ft. But it is also stated that the arch on the Newbury side "is hung on chains" from the high steep banks, and that it was "the first chain bridge in New England." In 1793 PALMER built another bridge over the same river at Andover, and, in 1794, the Piscatauqua bridge, 7 miles above Portsmouth, N. H. This last bridge was 2,362 ft. long, with the greater part of pile work. But over the center of this river was "a stupendous arc" of 224 ft. 6-ins. 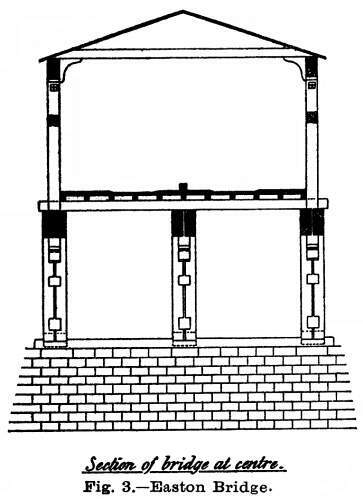 span, with a versed sine of 27 ft. 4 ins., and the depth of the framework of arch was 18 ft. 3 ins. The arch segments were selected from crooked pieces of timber, so that the fibre might run in the direction of the curves, and the general arrangement was such as to justify the local historian in remarking that this "is allowed to be a masterly piece of architecture, planned and built by the ingenious TIMOTHY PALMER, of Newburyport, Mass." In 1796 PALMER built abridge over the Potomac, at Georgetown. In 1796, RUFUS GRAVES built a bridge over the Connecticut river, at Hanover, N. H., consisting of a single arch of 236 ft., patterned after the Piscatauqua bridge of PALMER. This bridge fell in 1804 by its own weight. In 1795, a bridge 1,000 ft. long, made up of four arches and one draw-span, was erected between Newbury and Haverhill. It was carried away by ice in 1818. In 1794, PALMER built the bridge at Haverhill, with three arches of 180-ft. span, supported on handsome piers 40 ft. square. Bridges at Windsor, N. H., Rowley, Mass., and two over the Lehigh at Bethlehem and Easton, complete the record as far as found for the eighteenth century. In 1804-06 the Permanent Bridge over the Schuylkill at Philadelphia was designed and built by TIMOTHY PALMER. This bridge is shown in Fig. 1, and lasted until 1850, when it was renewed by a more modern wooden arch and widened to carry a railroad track. 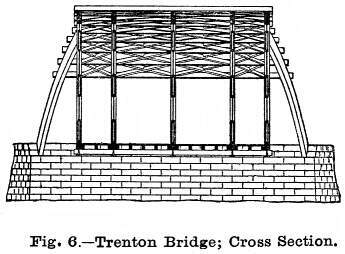 In 1805 Mr. PALMER built the bridge at Easton, Pa., on a very similar design, shown in detail in Fig. 2. This Easton bridge had three spans of 163 ft. in the clear, and is still in use after 84 years' service, with about five-sixths of the timber yet in good condition. In 1804 THEODORE BURR, built the Waterford bridge over the Hudson, consisting of four arch spans of 154 ft., 161 ft., 176 ft., and 180 ft. This bridge was built of hewn yellow pine and was not covered until 1814. It is still in use and in reasonably good condition (see Fig. 4). BURR also built another bridge over the Hudson, at Fort Miller, and in 1804-06 built the Trenton bridge (Fig. 5) over the Delaware river. This bridge had five arch spans, two of 203 ft., one of 198 ft., one of 186 ft., and one of 161 ft. in the clear. Each span had five arched ribs, made of white pine plank, 4 ins. thick, and breaking joints in an arch 32 ins deep. The lower chord was made of two sticks 6½ x 13½ ins. The roadway was suspended by vertical chains. The arch footings required renewal in 1832; In 1848 the bridge was remodeled by removing the wing arches shown, and adding a new and stronger arch on the south side, and strengthening the old arch rib so as to carry a railroad track; in 1869 it was again strengthened; and in 1875 it was replaced by the present iron structure. The Schenectady bridge over the Mohawk (Fig. 7) was built by BURR in 1808, replacing a previous bridge also built by him, which had fallen before or just after construction. The tradition is that the first bridge was to have two spans of 450 ft. each. The second bridge is a curiosity in bridge construction, for it is a suspension bridge in wood. The curved ribs were made of eight 4 x 14-in. plank spiked or bolted together, with the planks cut to long bevels for splicing. There were three ribs spaced about 13 ft. apart, and the timber used was white pine. This bridge stood thus for 20 years, until the excessive sagging made it necessary to put additional piers under the middle of each span. In 1873 it was replaced by an iron bridge. In 1812-16 THEODORE BURR built the bridge over the Susquehanna at Harrisburgh, Pa., with twelve spans of 210 ft. One-half of this bridge still remains, connecting an island with the mainland. LEWIS WERNWAG built his "Colossus" bridge over the Schuylkill river at Philadelphia in 1812. This bridge, with its clear span of 340 ft. 3¾ ins., was destroyed by fire on Sept. 1, 1838. In 1814 WERNWAG built the Newhope bridge over the Delaware river, with six arched spans of 175 ft. each. In 1810 he built a wooden cantilever bridge over the Nashamony river, Pa., and called it his "Economy" bridge and claimed that it could be used to advantage up to 150-ft. spans. WERNWAG built many bridges from this date to 1836, including his first railroad bridge in 1830 at Manogway on the Baltimore & Ohio R. R., and his last bridge carried the railroad over the canal and Potomac at Harper's Ferry, Va.
(See ENGINEERING NEWS, Aug. 15, 1885, for plans of this and two other Wernwag bridges here described. 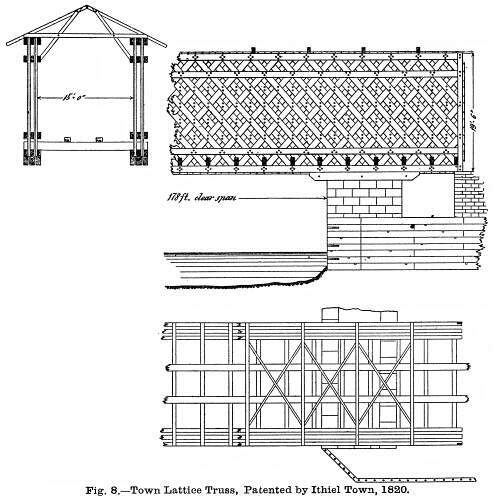 All of the previously mentioned bridges of any magnitude seem to have been arch bridges, and the first marked step towards bridges of modern-truss form was the wooden lattice, patented by ITHIEL TOWN in January, 1820. This bridge (Fig. 8) had its horizontal members, or chords, composed of two or more parallel sticks so spaced that the diagonal web members passed between them. The timbers were usually 2 to 4 ins. thick and 10 to 12 ins. wide. The timbers were of one size and of reasonable dimensions, and all connections were made with wooden treenails, so that these features, combined with the simplicity of its erection, made it a cheap and popular structure. A great number of these bridges were built in the United States, up to spans of 220 ft. for both highway and railway purposes, and many of them ore still in existence. The next step toward simplicity of construction was the truss patented by Lieut. Col. STEPHEN H. LONG, U. S. Engineers, in March, 1830, and November, 1839. Many of his bridges were combined with the arch, as was also the Town lattice, especially for long spans. In 1840 WILLIAM HOWE patented the truss which was the basis of the present well-known Howe truss bridge. For some years this latter, was the standard truss for use on railroads. In April, 1844, THOMAS W. and CALEB PRATT patented the truss known under their name, which differed from the Howe truss in having the diagonals in tension and made of iron and the verticals under compression were in wood, just the reverse of HOWE'S patent. The Pratt became the favored form and was afterwards adopted for iron bridges, and is therefore one of the steps in the development of American bridges. The history of iron bridges really reaches back to 1786, when THOMAS PAINE made three models for a bridge over the Schuylkill in Philadelphiaone in wood, one in cast-iron, and one in wrought-iron connected with blocks of wood representing cast-iron blocks. At this time the only iron bridge in England was the cast-iron arch over the Severn near Coalbrook Dale. PAINE took his last model to Paris in 1787, and proposed it for an arch bridge of 400-ft. span, and afterwards actually had built in England five cast-iron arch ribs of 110 ft. span to test his theories; but the engineer's interest in bridges was lost in his interest in the French Revolution, and his bridge was sold for the benefit of his creditors. He made a vain attempt in 1803 to enlist the U. S. Congress in his bridge building projects. Nothing more was done with iron bridges until about 1830, when LONG and TOWN both suggested that their bridges could be built of iron. In 1833 AUGUST CANFIELD took out the first patent for an iron truss bridge, and the first one actually built is believed to be the one erected over the Erie canal, at Frankford, N. Y., in 1840, by Mr. EARL TRUMBULL. But in the same year SQUIRE WHIPPLE built his first iron bridge, and he took out a patent on April 24, 1841. 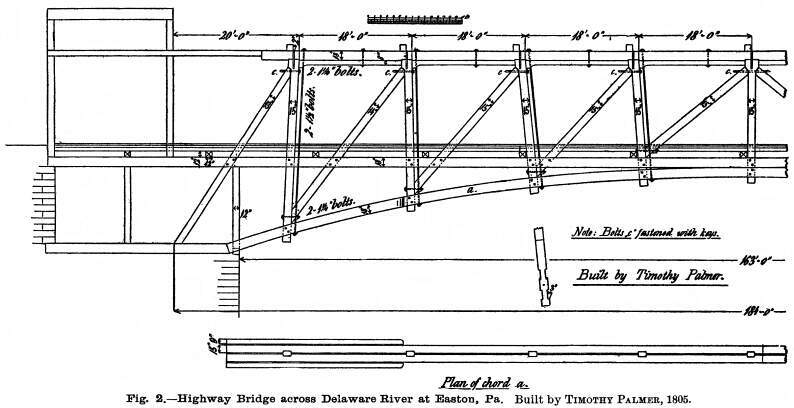 In 1846-47, JAMES MILLHOLLAND built a boiler-plate tubular girder 55 ft. long for the Baltimore & Ohio R. R. In 1846, FREDERICK HORBACH patented an iron Howe truss, and a bridge of this type was built in 1846-47 on the North Adams branch of the Boston & Albany R. R., near Pittsfield, Mass. In 1847-50, NATHANIEL RIDER built for the New York & Harlem, Erie, and other railways, a number of iron bridges with parallel top and bottom chords and multiple systems of vertical posts and diagonal ties. The top chords and posts were cast-iron and the lower chord and ties were flat bars of wrought-iron. The failure of one of these Rider bridges in 1850 on the Erie R. R., following the failure of the English bridge over the river Dee, caused the officials of the line to declare iron bridges untrustworthy and they directed all iron bridges, consisting of several Rider and some Whipple bridges, to be taken down. They were replaced by wooden structures. It is claimed that the general adoption of iron for railroad bridges was given its first impulse by Mr. BENJAMIN H. LATROBE when, as Chief Engineer of the Baltimore & Ohio R. R., he extended the road from Cumberland to Wheeling and decided to use this material in all the bridges. His assistant was then Mr. ALBERT FINK, whose plans were adopted for all these structures. From henceforward it will be sufficient simply to give the names and dates of some of the more prominent early iron bridge designers. In 1852 a Bollman truss of 124 ft. was built at Harper's Ferry, and in 1851-52 three 205 ft. Fink trusses were built over the Monongahela river. In 1852-53 SQUIRE WHIPPLE built an iron bridge of 146 ft. span on the Rensselaer & Saratoga R. R., 7 miles north of Troy, N. Y., on the type afterwards known as the Whipple truss. It continued to do good service until 1883, when it was taken down, owing mainly to the great increase in the rolling loads coming upon it. Mr. F. C. LOWTHORP built his first railroad bridge in 1857 on the Catasauqua & Fogelsville R. R. In 1856 JOHN W. MURPHY, C. E., built a Whipple bridge, still standing, over the Saucon Creek for the North Penna. 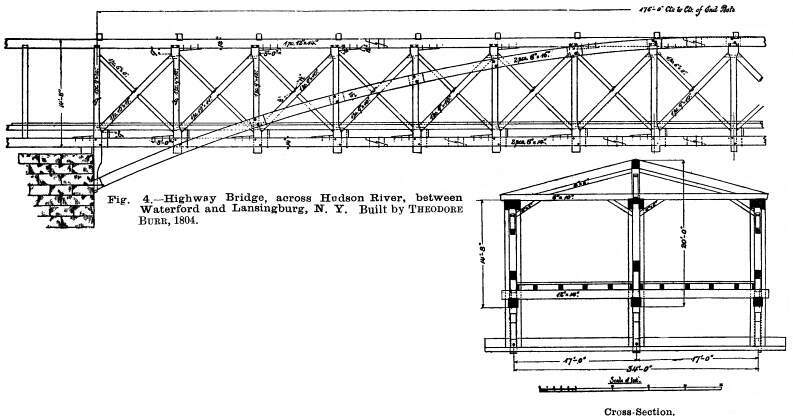 R. R., and in 1858-59 Mr. MURPHY built a Whipple-Murphy truss over the canal at Phillipsburg, N. J., with 165 ft. span. In this bridge he substituted pins of unturned wrought-iron and looped eyes on his tension members, for the cast trunnions on the foot of the Whipple post and the wrought-iron links there used. This, Mr. COOPER says, is the first truss bridge that he has been able to discover that was pin-connected throughout. In 1861 Mr. JOHN H. LINVILLE built a bridge on the Delaware extension of the Penna. R. R. over the Schuylkill river, in which were used for the first time wide forged eye-bars and posts formed of wrought-iron sections. The bridge built by JOHN W. MURPHY over the Lehigh in Mauch Chunk, in 1863, was the first in which he used wrought-iron for both posts and top-chord sections, and it was probably the first American truss in which the tension and compression members were both of wrought iron. He used cast-iron joint blocks and pedestals, however. The Post truss was first used in 1865 by Mr. S. S. POST on the Erie railway. In 1859 Mr. HOWARD CARROLL commenced building riveted lattice bridges for the New York Central R. R. and its connections, and was followed therein by Mr. CHARLES HILTON, his pupil. In 1864, Mr. FELICIAN SLATAPER designed and built a bridge of five riveted lattice spans of 178 ft. each over the Allegheny river at Pittsburg. Mr. LINVILLE inaugurated the era of long-span bridges in America with a channel span of 320 ft. in the Steubenville bridge over the Ohio river, built between 1863-64. Mr. FINK followed in 1868-70 with the Louisville bridge, with two main spans of 360 and 390 ft. In 1870 Mr. LINVILLE put 340 ft. spans in the Parkersburg and the Bellaire bridges over the same river, and in 1872 he built the Newport and Cincinnati bridge with a channel span of 420 ft. In 1868-74 Mr. JAMES B. EADS built the St. Louis bridge with its two arches of 503 ft. and center arch of 520 ft. clear span. In 1876 the Cincinnati Southern bridge was built with a 519 ft. truss (the largest truss span to that time) from specifications of Mr. G. BOUSCAREN and designs by Mr. J. H. LINVILLE. The channel spans of the Henderson Bridge, 522 ft., and of the Ohio River, Kentucky Central R. R. bridge, at Cincinnati, 550 ft., are the only independent truss bridges up to this time, with greater spans. There are now in existence on American railroads over five miles of bridges with spans from 300 to 400 ft., nearly four miles with spans from 400 to 500 ft., and two and one-half miles with spans exceeding 500 ft. estimated as single-track bridges and excluding wire suspension bridges. The first cantilever bridge of importance was built in 1876-77 by C. SHALER SMITH over the Kentucky river. The second and third were the Niagara and the Frazer river bridges, designed by Mr. C. C. SCHNEIDER, the first in 1883 and the other in 1885. The largest cantilever is the Poughkeepsie bridge, lately completed. 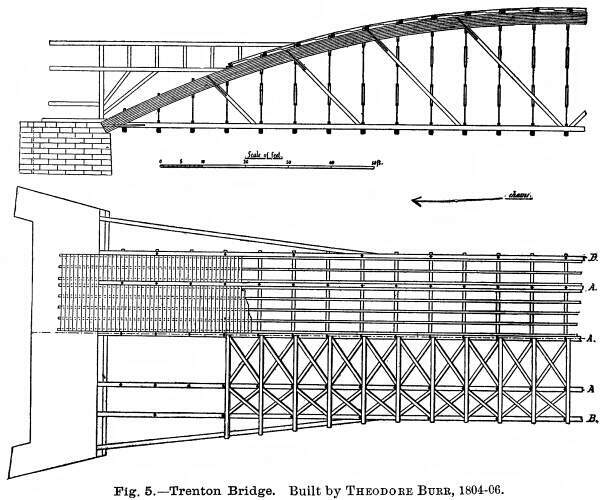 The remainder of Mr. COOPER'S paper is devoted to designing and proportioning bridges, the strength of material and parts of skeleton structures, the manufacture of bridges, the erection of bridges, the relative merits of typical American railroad bridges, and statistics of the amount and kind of bridges on the railroads of the United States. This matter is of a character that cannot be dealt with justly or usefully by an abstract, and we will not attempt at present to give any more than the above outline of its value.